Gmail has turned 10 this year. In a decade, Google has churned out several useful extension for its two popular products -- Gmail and the Chrome browser. Gmail offers Chrome extensions for Gmail. Since Gmail entered the foray of email, this advertising-supported email service has put forth a great competition to the popular email service provider Hotmail from Microsoft. Now Gmail is theleading email service provider in the world. It was in 2008 when Google expanded its horizon in the virtual world with the offering of Chrome browser. The combination of Gmail in the Chrome browser is a seamless integration of two top applications, enhancing each other’s feature sets. 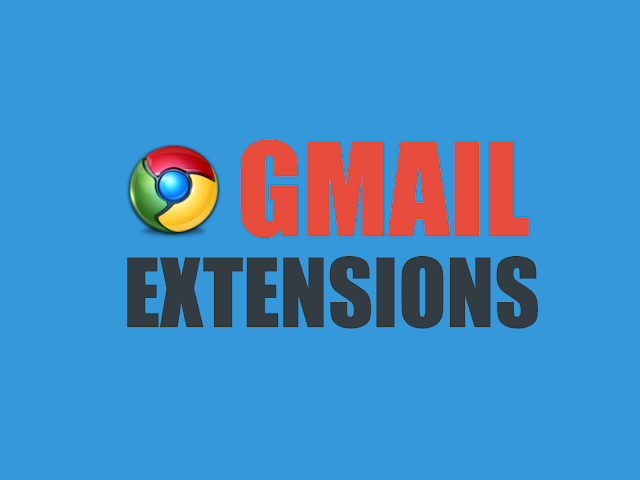 There are various Chrome extensions that adds amazing features to Gmail and enhances the user experience. This is the one of best Gmail extensions. As the name suggests, it is the extension that enables the user to access Gmail even when not connected to internet . It is a free extension and you can read, respond and search the messages when you want. This is again a free extension that you can use for Gmail through Chrome. The best feature of this extension is that the mailto: links open a new message window only in Gmail, which is in contrast to other browsers that opens the new message window through an external email client. This is the best Chrome extension for the users who have multiple Gmail accounts. The loads of features like drop-down menu in Chrome, color coding, desktop notifications and most popularly the voice input for message writing are the coolest in the segment. This is not a free extension though. This is a free extension for Gmail in Chrome. Instead of clicking Send button, hit the mxHero button and you can see the change in the way you work. There are features like tracking time of opening a message, it will let you know if the attachment is clicked or not. The coolest feature is self-destruct, which enables the message to get deleted automatically after five minutes the receiver read it. Gmelius is a free extension that is built by Google keeping the user interface of the users in mind. This extension gives the users somewhat control to restore the old interface elements that include the original compose window. The users can hide the features like advertisement pop ups through this extension. Secure Mail is a free extension that is built keeping privacy of the user in mind. This extension is kind of a protective tool that refrain anyone to peeping into your Gmail messages. The tool does this by the method of encryption and decryption. This tool allows you to include a password to your message that you are sending out. This extension is a useful tool for those who receive a lot of emails in their inbox and apparently all emails are to be responded. This tool enables the user to put snooze functionality, which is kind of reminder and it will put a pause to the message for five minutes for the entire day. This tool is an effective one for those are in need of a lightweight solution that help them in effectively managing their email. This is even a great tool for those who want to use Gmail itself as their main task manager. With this functionality you will never forget an important task, which is tracked in the sidebar of Gmail inbox. A free Chore extension like Rapportive is the tracker for you to know who has sent you the email. The tool embeds a sidebar of every message you receive, which helps you know their status update and stuff on social media. This also allows you to make notes about the message and access it later. This is your perfect companion to learn keyboard shortcuts that are existing in Gmail. All these keyboard shortcuts are very much useful and have the capability to make you pro in using Gmail. The interface of this tool is built in such a way that every move of the user gets tracked every single time. You can bring the power of Evernote, OneNote as well as Dropbox to your Gmail functionality. This tool enables you to clip the part of a message and even the whole message thread from Evernote, OneNote or Dropbox. You can also add reminder and select notebooks or tags – and guess what – you can do all these without leaving out Gmail. It is known that Gmail has the feature to add signature. But that signature is not a very robust kind. WiseStamp is a third party extension where you can create you signature with some extra stuffs like your company logo or the latest tweet and import it to Chrome extension. The premium version allows you to have five signatures and rotate as required. This is one of the coolest extensions for Gmail in Chrome. This tool allows the user to write message and schedule the sending of the message at some later point of time – even though you are not online. The user can track messages that ensures you receive a response and it allows you to create a reminder right inside Gmail. This is a free extension for Chrome that you can use to send text messages using your Android phone directly from Gmail. This extension not only allows you to send SMS but also MMS and group messaging. Just sync this extension with your Android phone and enjoy. This app also shows low battery alerts and battery status in Gmail itself. This is a cool app which gets integrated seamlessly with Gmail and allows to schedule your email to be sent a future date. This tools also allows it users to create reminders to the conversation along with recurring emails. The tool is the perfect companion for Gmail and offers a range of features to the user. This another email schedule tool for Gmail that is useful for you. Once you schedule the date and time for the email to be sent, the tool automatically performs the job. The scheduled emails remain seated in the Drafts folder of your inbox and the best part is it does not mess up your emails. As the name suggests, it's a cloud computing extension or tool for Gmail. With this tool, the attachment of files from Dropbox, Instagram, Facebook, Evernote and others become effortless. You do not need to leave Gmail in order to attach files from various cloud services available. The app seamlessly gets integrated with Gmail. This amazing tool saves your emails in Gmail inbox as tasks. This is a leading online task manager and to-do-list. This customizable tool makes your Gmail inbox a more organized and help you manage the tasks so that you do not forget anything important that need to be addressed. Just two clicks and your email becomes a task. This tool works the same way as it is named. You just have to mention the email address that you want the emails to be Bcc’d and the tool automatically picks up the email address every time you compose a new email or reply and forward any email. With the integration of this tool, it appears as Bcc Me dropdown at the top of the Gmail page. So you don't want to see ads on your Gmail page? Don’t worry. Ad-blocker is there for you. With this tool you can hide the ads in your Gmail inbox. Once the ads are blocked, the message gets expanded and fits to the screen for a better viewing experience. The app does it by embedded CSS stylesheets, also Java is not required. This is a useful tool that is recommended for everyone, especially if you are running a business. This gives your email a branded look with your customized dynamic signature, company logo and email template. This tool can proved to be a potential marketing and branding tool for your online promotional strategy. This is an email tracking analytics tool that is useful for tracking who is opening your email and clicking on the link. It takes guesswork approach and instantly shows the frequency at which your emails are being opened and when it was opened. This tool gives you notifications every time your email is being accessed. This useful tool is a blocking tool that enables the user to block the tracking when they open or read an email sent to them. It protects your email privacy. A red eye is displayed in the email of your Gmail inbox that shows the tracking mechanism is disabled in the email that you are opening. Do you want to embed a reminder in your email? If the answer is yes then this is the best tool. It is a simple email reminder tool, which is fast and schedules reminders on your email. With the implementation of this tool, you will never forget to follow-up a lead or lose track of your clients. This useful tool is a one-stop shop for all your web notifications. This tool aggregates all your notifications from Twitter, Facebook, Gmail, Reddit and many others. It is secure to use as there is no server side-code being written for this tool. All your personal data remains in your computer. This is an encryption and decryption tool that performs an encryption and decryption function in your email. It follows the OpenPGP encryption standard and it gets integrated directly into the webmail user interface. The non-intrusive elements are easy to use in the regular workflow. This is preconfigured tool that goes along with major webmail providers. This article explained in brief a few popular and easy-to-use Chrome extensions for Gmail. It is up to the user to choose the right tool as per their usage and requirements. All the extensions explained can be useful for the users in some way or the other. It is recommended to try these extensions to enhance your Chrome and Gmail user experience, rather than using Chrome and Gmail just as a web browser and webmail provider.